Hey there, friends! Are things starting to warm up where you are? Do you find yourself dreaming of Spring and Summer? Well, I have just the treat for you. 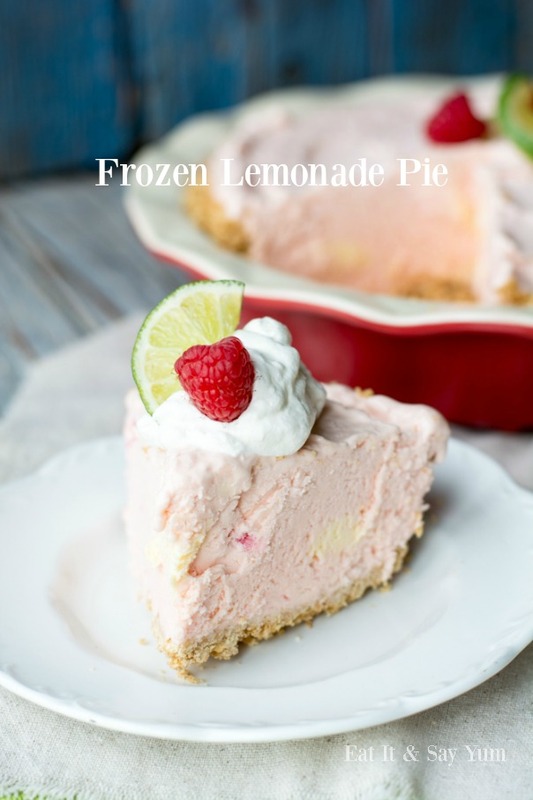 This Frozen Lemonade Pie is perfect for the next seasons because it combines some great citrus flavor with the bonus of being frozen. So, it’s great for cooling down with, and perfect for serving at those outdoor barbecues this summer. This pie is so simple to make, and only uses a few ingredients. One of those ingredients is frozen lemonade concentrate. Which is a great, because you can choose whatever flavor you want to make lots of possibilities for this pie. 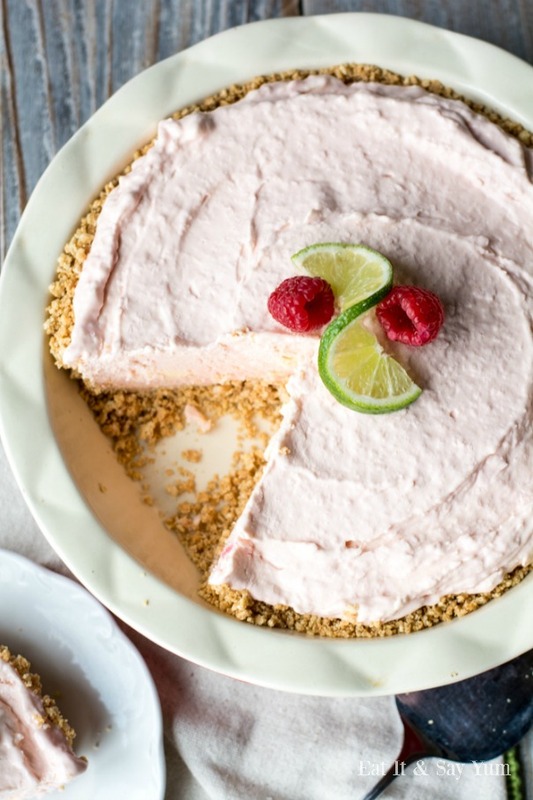 The pie I made is a Raspberry Limeade flavor. Some other ideas are Pink Lemonade, Strawberry Lemonade, Cherry Limeade, plain old Lemonade, etc. Pick your favorite flavor! 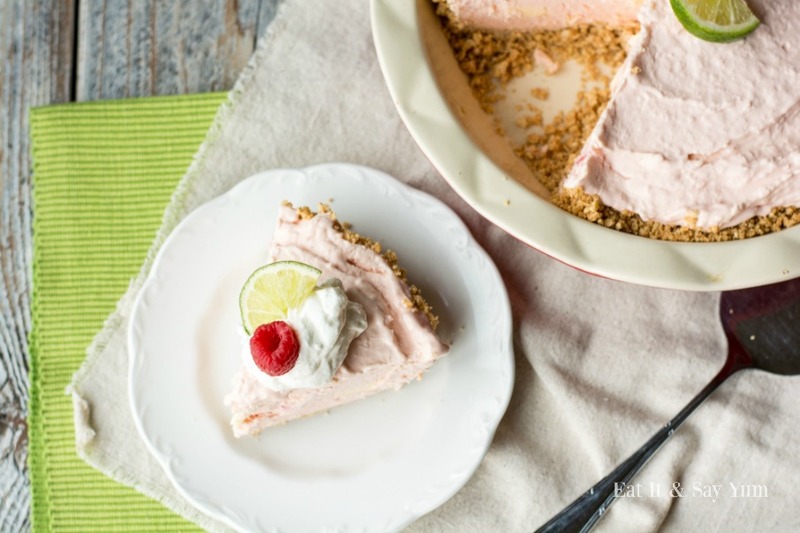 The crust for this dessert is just a graham cracker crust. But I think Nilla Wafers, or vanilla sandwich cookies would work great as well. The pie does need to set up in the freezer for several hours, so plan ahead. You can actually make this days in advance and have it waiting in the freezer for whenever you are ready. I would let it sit out of the freezer for 10-15 minutes before serving, so it softens just a little. It will be easier to slice and serve that way. I added some whipped cream and fresh fruit (to match the flavor of my lemonade concentrate) as a garnish. Just looking at this treat has me longing for summer! Set your vanilla ice cream and lemonade concentrate out on the counter for about 10-15 minutes to soften. Mix your crushed graham cracker crumbs with the melted butter. Press them into a pie pan, covering the bottom and up the sides. Place the pan in the freezer. In a large mixing bowl add the vanilla ice cream and the lemonade concentrate. Use a large spoon to mix them together until they are evenly combined. Pour the mixture into the graham cracker crust. Smooth the top of the pie, and place back in the freezer until it is firm again. Before serving, let the pie rest at room temperature for about 10 minutes, then slice and serve. You can top each serving with whipped cream and/ or fresh fruit. So what flavor lemonade do you want to try? !